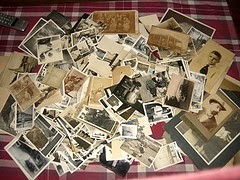 A year ago today, I submitted a post on some Google+ genealogy groups to get input and recommendations about how to best take on a rather large project of scanning the family photos that are now in my possession. There are many boxes, photo albums, and slides full of both identified and non-identified pictures of my relatives and family friends. As seems to often happen, the project never really got off the ground. Certainly I loved the input that everyone gave and I also did research on naming conventions and archival pens. Alas, it never became a priority...until now. I've recently started having space issues on my laptop's hard drive. My digital pictures take up more than half the drive and it's gotten to the point where I often worry if I'll be able to download pictures from my camera to the laptop. I use cloud-based services and external hard drives for backup storage, but the main drive is saying, "Help me!" I'm happy to say that I bit the bullet last night and ordered a Synology DiskStation DS1513+. This is a NAS device that has received rave reviews by techies like myself and will give me plenty of storage for my current files plus all the soon-to-be-scanned ones. I am really jazzed about this! With my storage issues solved, my archival pens at the ready, and my scanner dusted off, I'm ready to begin this long adventure of digitizing my family's photographic past. I'm looking forward to the challenge and will post updates along the way.